DETROIT (AP) — Owners of five Hyundai and Kia cars and SUVs file fire insurance claims at a rate far higher than the average for comparable vehicles, according to an insurance industry study. The Highway Loss Data Institute, which analyzes data from insurers representing about 85 percent of the U.S. industry, found that some Hyundai and Kia vehicles equipped with four-cylinder engines have double the noncrash fire claim rates than the average of comparable vehicles. Last week the South Korean brands announced they would recall about 168,000 vehicles to fix a fuel pipe problem that can cause fires. The problem stems from improper repairs during previous recalls for engine failures. They also announced additional sensor software for another 3.7 million vehicles. Hyundai and Kia started recalling 1.7 million vehicles in 2015 — about 618,000 of which are Kias — because manufacturing debris can restrict oil flow to connecting rod bearings. That can cause bearings in 2-liter and 2.4-liter four-cylinder engines to wear and fail. The problem can also cause fires. The repair in many cases is an expensive engine block replacement. Results of the Arlington, Virginia-based institute's study have been turned over the U.S. National Highway Traffic Safety Administration, which is investigating engine failures and fires in Hyundai and Kia vehicles. The agency is mostly closed this week due to the partial government shutdown. Hyundai said Tuesday that the majority of its models in the study are already being recalled or are part of additional actions to keep customers safe. "Hyundai actively monitors and evaluates potential safety concerns, including non-collision fires, with all of its vehicles and acts swiftly to recall any vehicles with safety-related defects," spokesman Michael Stewart said. 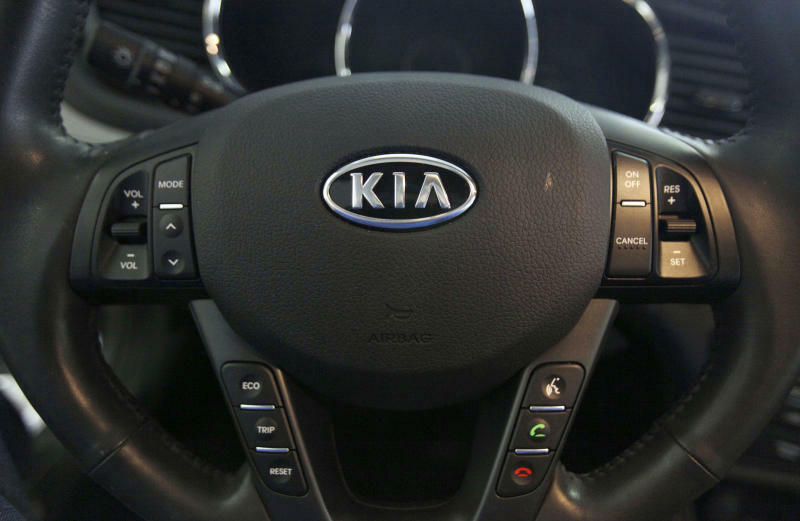 Kia spokesman James Bell said the company is cooperating with NHTSA "and will take any necessary corrective action in a timely manner." Many of the fires involve vehicles included the engine failure recall and could have been prevented if owners had the recall repairs done, he wrote. The institute began studying fire claims after the Center for Auto Safety petitioned NHTSA last year seeking a wider recall of Hyundai and Kia vehicles. The center had found a higher-than-normal number of consumer complaints about Hyundai and Kia fires in the agency's database. NHTSA has used Highway Loss Data Institute studies in the past to help make recall decisions. According to claims data, the 2011 to 2015 Kia Optima, the 2011 through 2014 Hyundai Sonata, the 2011 through 2015 Kia Sorento, the 2011 and 2012 Hyundai Santa Fe and the 2013 and 2014 Hyundai Santa Fe Sport all had higher noncrash fire claim rates per 10,000 insured vehicle years than the average of comparable vehicles. The Optima with a 2-liter turbocharged four-cylinder engine had five claims, nearly triple the average of 1.7 claims for 21 other midsize cars. With a 2.4-liter engine, the Optima had 2.8 claims. Hyundai's midsize Sonata with the 2-liter engine had 4.2 claims, while its 2.4-liter engine had 2.7. The Kia Sorento with a 2.4-liter engine had 2.6 claims, double the 1.3 for the average of 50 comparable SUVs. Hyundai's Santa Fe with the 2.4-liter engine had 2.1 claims, while the Santa Fe Sport with the 2-liter turbo had 2.9 claims per 10,000 vehicle years and 2.2 claims for the 2.4-liter engine. The institute also found that while noncrash fire claims are infrequent, turbocharged engines have higher claim rates. Turbos help to send more gasoline into engines, making smaller engines more powerful. The Hyundai-Kia fuel injector pipe recalls cover some 2011 through 2014 Kia Optimas, 2012 through 2014 Sorrento SUVs, and 2011 through 2013 Sportage SUVs, all with four-cylinder engines. Also covered are many 2011 to 2014 Hyundai Sonata cars and 2013 and 2014 Santa Fe Sport SUVs. The companies say owners of the recalled vehicles will be notified by letter. Dealers will check the fuel pipe for leaks and replace the pipe if needed. More than 2 million 2011 Sonatas from the 2011 through 2018 model years and Santa Fe Sports from 2013 through 2018 are covered by software and engine knock sensor updates. About 1.7 million Kias including the 2011 through 2018 Optima, the 2012 through 2018 Sorento and 2011 through 2018 Sportage are covered.